Powerful people realize how important it is to keep this Authoritarian Collective moving forward, the West IS being reshaped. The EU in/out referendum will be a replay of the second Irish referendum (Lisbon Treaty) and as a commentator said short of Karzai-style stuffing of the ballot boxes the European and Irish political establishments could scarcely have done more to push this second Irish referendum in the way they want. "To ensure a "YES" vote, all the normal rules governing balanced media coverage were suspended. The European Commission poured €1.5 million into an unprecedented advertising blitz. 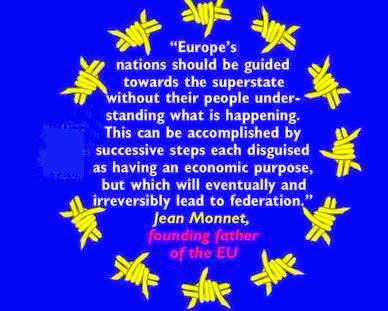 The voters of Ireland had the chance to say "NO" to the political class which now rules over them thanks to what has amounted to the most extraordinary slow-motion coup d'état in history"
The survival of the EU is far more critical, anything and everything will be permitted to ensure there is no breakup of the European collective. As with the Irish referendum frightening the people with non-truths will be the order of the day. The EU Chief Jean-Claude Juncker is doing just that. He is terrified of the clear and present danger of the wall coming down and National borders going back up again and self-rule being returned to the people of the occupied territories and he and many of his work-mates having to work for a living. TRUST ME ON THIS ONE, IT WILL BE A VERY DIRTY GAME The money from the EU coffers for contingency plans such as this and the corporations like Ryanair that ensured a YES vote at the second Irish referendum will pale into insignificance compared with the amount available reserved for the EU in/out referendum. LET THE GAMES BEGIN. To affect a referendum result two things are needed Funds and ‘Frighteners’. It worked fine in Eire it can work again in Europe. Huge funding is obvious but let me explain the ‘frighteners’. The EU Chief Jean-Claude Juncker came up with a corker. He warned Britain could spark World War three if it votes to leave the Union. Yes it gets as desperate and infantile as that and we will not understand it until we understand how important it is that this monstrosity stays together like a Blowfly with its larvae. His comment of impending doom might sound bizarre but lies are lies, but what is most bizarre is their degree of the nonsensical. 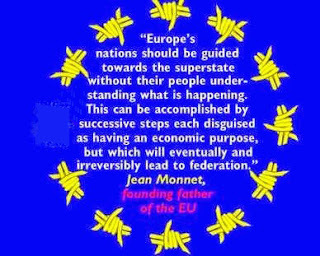 Woe betide any regions that threaten to leave the European Super State particularly the wealthy ones. Even the former Prime Minister of Luxembourg has been dragged into “Team Project” fear by saying that: "Whoever does not believe in Europe, whoever doubts Europe, whoever despairs of Europe, should visit the war cemeteries in Europe. Frankly I cannot see any connection of leaving the European Collective and European War Cemeteries but the Former Prime Minister of Luxembourg could, well his job is also on the line. One can almost feel the panic setting in. Norway is not part of the EU but is part of the Schengen Agreement and it is crucial that borders remain under the control of Brussels. Norway co-operates with the EU on foreign and security policy issues, .which is a misnomer if there ever was one. Not having control of ones borders one loses the ability to secure those borders as the people of Sweden are finding to their nightmarish horror. the Schengen Agreement was critical for a single Europe it allowed the free movement of persons and was the core part of the original Treaty of Rome from the early days of the European Economic Community, nationals of EEC member states could travel freely from one member state to another on production of their passports or national identity cards which explains why The UK has the highest number of immigrants from Poland and which ranks second behind India for non- Britons living in the UK. If 250,000 displaced Syrians and 100,000 Africans who have made it to Europe and have gained residency “have the right to demand entry as nationals of EEC member states to travel freely from one member state to another on production of their passports or national identity cards” Norway who are not a EU member can also be their final destination as they also ceded their borders to Brussels via the Schengen Agreement. I RATE THE EVENTUAL BREAK- UP OF THE EU AS OF EQUAL IMPORTANCE AS THE FALL OF THE BERLIN WALL AND EAST GERMANY JOINING THE REST OF EUROPE. I have enjoyed reading your articles from the days of Green Arrow and do pop through your site on occasion looking for new articles. I have often wondered why you don't write for Western Spring? I am sure you would give that site a welcome boost as of recent they seem to have stagnated slightly which is a shame as I had great hopes for them. Still haven't found an equal to the British Resistance or the members, who were like minded gentlemen. Hiya Crazy Englishman, yes I have fond memories of Green Arrow. I suspect Paul had some serious threats aimed at him prior to leaving by the British Franchise of the Fascist group the UAF. I was very disappointed the British Resistance closed down. What we must understand is anything can be closed down, the smaller the voice the easier it is to close it down, the people have absolutely no idea the amount of surveillance being placed on them. I occasionally visit Western Spring and have left the odd comment. I lose heart seeing the events taking place in Europe. I have got to a point where I seem to go round and round in circles writing the same thing but differently. I have been tempted to write an article on what I see as a plan for the world in the making, it might be seen as the conspiracy theory to end all conspiracy theories as nothing else really little makes any sense.